Singer and bass player Peavy Wagner has fronted German band Rage since it formed in 1984 (initially as Avenger) and Refuge is the band created when he re-united with two former Rage members in 2014. 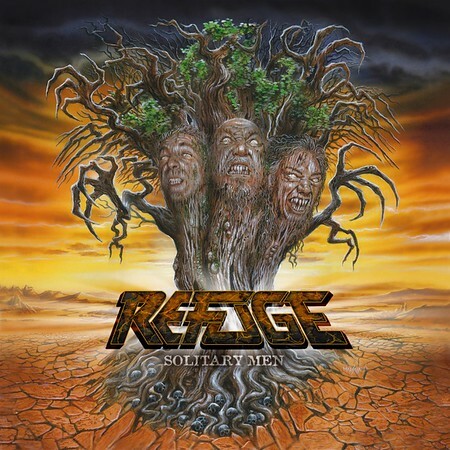 “Solitary Men” is the debut album from Refuge and it was released via Frontiers Music on 8th June. The track “From The Ashes” was featured on the Friday NI Rocks Show on 4th May and “Mind Over Matter” was included on the Show on 1st June. The three members of Refuge together made up the line-up of Rage from 1987 to 1994 and they released five studio albums during that time. Guitarist Manni Schmidt was a member of Rage from 1987 to 1994, whilst drummer Christos Efthimiadis was with the band from 1987 to 1999. Peavy Wagner continues to record and tour with Rage who released their latest album “Seasons of the Black” in 2017. In 2014 the three band members decided to play a secret show in their home town, performing as ‘Tres Hombres’ and 1,200 fans turned up to hear them play Rage tracks from their time together. From there, Refuge was born and the band played shows across Europe and Japan in 2015 – 2016. “Live at Rock Hard Festival” was recorded in 2015 for a ten disc boxset called “The Refuge Years” which also included the five Rage albums that the three had recorded together. The simple idea behind “NI Rocks Recommends” is to acknowledge and promote some of the great music being submitted to Rock Radio NI. The albums that I’ll be recommending are those that you’ll hear me playing tracks from on my shows. I'll not be giving marks or ratings or analyzing the tracks in great detail; just telling you something about the artist and the album. It’s a personal recommendation to go check something out, not a traditional "review”!